This is simply a carded pack of 3 ordinary Sonic theme pencils. 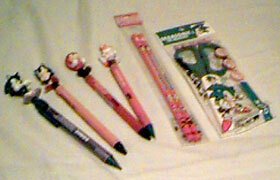 In a somewhat unusual touch (for Japan) these actually have erasers. Finger waving stock Art Sonic is repeated all over every white pencil, and several stock arts are on the card packaging. What does it say at the top? "Pencils". 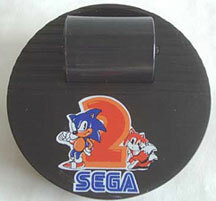 The bottom just has Sega Copyright. Photo by SegaFreak. 3 Sonic pens. A regular one, and 2 clear varients. But why pink? It is not known what type of pens these are, but they appear modern, more in the Sonic X or adventure era, than anything before. 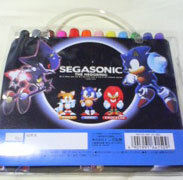 They could be gel pens, and if so, one would hope they work better than the USA SA1 gel pen set that was released. Maybe the two colored figures indicate that they had matching ink colors. Do you click or twist the figure to use the pen tip? Here is a rare & unusual bag! This is likely an accessory bag of some sort. It's shaped & designed like a soccer football. It has a carry handle & a shoulder strap. The back has an emblem of an "S" in a winged circle. 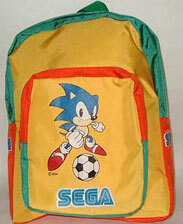 The front has Sonic's eyes in the pentagon black part of the soccer ball along with "SegaSonic" written on one of the sides. It has a zipper closure & appears to be plastic looking faux leather. This appears to be some kind of cloth covered notebook or book. What's inside? Is it blank like a diary? 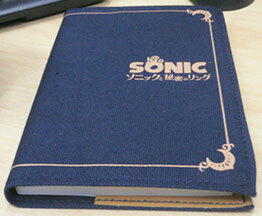 The cover seems to be made of (or covered with) blue-jeans type material. The Secret Rings logo & border accents are on the cover, with what is likely the title in Japanese. You can see the stitches all around the edge of the cover. Supposedly, this wasn't actually released, except as some kind of "prize" to the people who worked on the game. Do you know the story behind this covered book & what's inside? 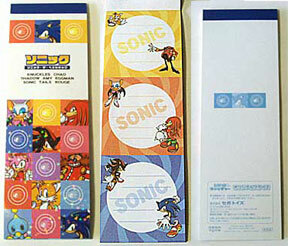 In 2008, The Sonic Channel re-released some stationary that you could buy. You can see the dolls holding onto it here for their display photo. 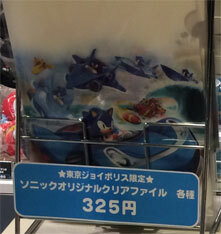 It also appears to have a little 'scribble Sonics' sticker sheet. There is text on the main blue piece. "Sonic the Hedgehog is always on the move - but ____* his mission, goodheartedly when found saving the world is all in a day's work - to go to his next adventure. do anything in his power to protect until the job is done." 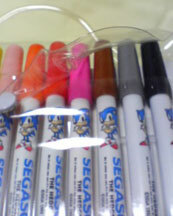 Tombo 12 Color Pens Tin Sonic Vs. Metal Sonic Theme. Here's a better look at the item from School 2, the Tails themed ball-top pen or possibly mechanical pencil. Of course, there's a Sonic one too, no-matter which this is (pen or pencil) the "Life of Power" quote is there at the bottom, & Segasonic logo at the top. 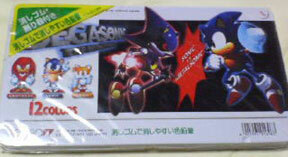 This tall, thin note pad is reportedly a promo item for Sonic Adventure 2 Battle. It is nicely themed, with colorful portraits on the front, logo & bit of pattern on the back. The notes inside (middle) are long sheets divided into 3 colored areas with lines for writing. Tails & Eggman, Rouge & Knuckles and Sonic & Shadow appear on yellow, orange & blue swirls. This is a cool and colorful pad to collect. Here are more 'clear files', this time, shown on display in a store. 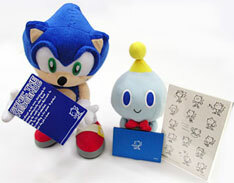 The left one is very cute, it has little/cute style simple Sonic running & looking at the viewer in one corner. 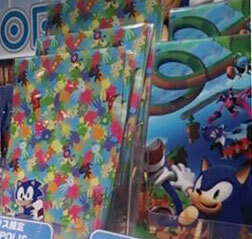 The colorful all-over pattern you see there are Wisps from Sonic Colors. They make a fun pattern. The right side folder / paper holder has all CG art instead. It has CG jumping Sonic large at the bottom, part of a level, and likely most of the members of The Deadly Six flying around in the background. These are defenentely cool school accessories to keep organized with. But where's the store that sells them?